A rescue operation is under way in the Philippines in the wake of one of the strongest storms ever to hit the country. Typhoon Haiyan left a trail of devastation through the central islands - the city of Tacloban in Leyte province is one of the worst affected areas. 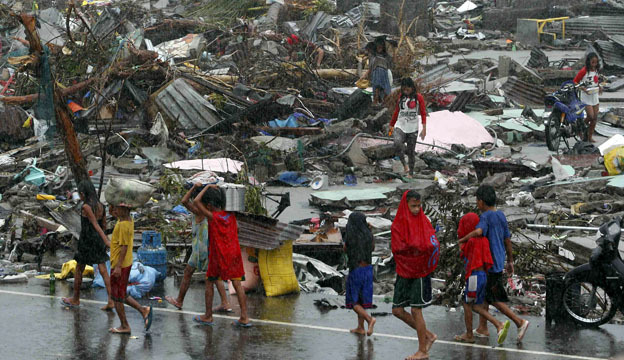 Aid efforts in the Philippines have been hampered by bad weather. Millions of people have been affected and relief workers are struggling to get supplies into the worst-hit areas. The exact number of dead is still unknown – but it is believed more than 10,000 residents died in the city of Tacloban alone. Jon Donnison reports from the city where hardly a single building has been left standing. 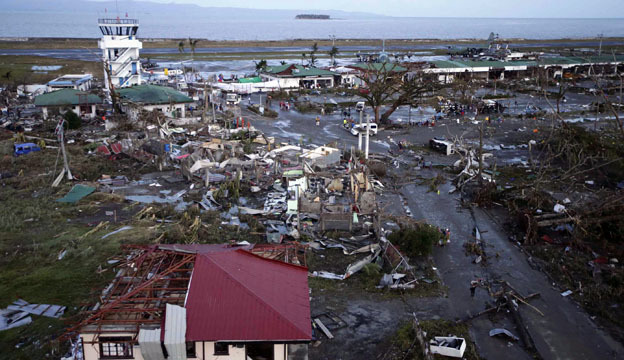 Much of Tacloban was devastated by the typhoon and resulting storm surge. Roads in and out of the city have been blocked by people trying to get in to find relatives and friends and people desperate to get out. Officials say the death toll may rise even further than the current 10,000 estimate as the full scale of the devastation becomes clear. Most of those who died are thought to have drowned or been crushed by collapsing buildings. Hundreds of people have gathered at Tacloban airport � some are desperate for food and water, while others are trying to get a flight out. The airport partially reopened on Monday 11 November, three days after the typhoon, but only for flights carrying relief supplies and equipment. The airport has also become a makeshift morgue for the growing number of bodies. 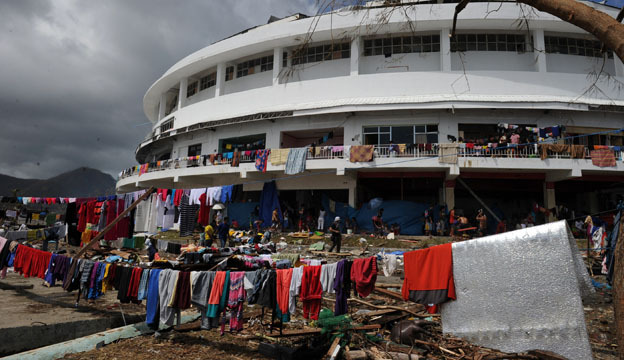 The city’s sports stadium withstood the force of the storm and thousands of people have now taken up temporary residence there. There have been reports of people attacking trucks loaded with food, tents and water, as supplies of food and medicine in the city run low. Severed roads and communications have hampered relief efforts. The true scale of casualties remains unclear. The authorities say at least 10,000 people may have died in the disaster - and according to UN officials about 11 million people have been affected - many have been left homeless. 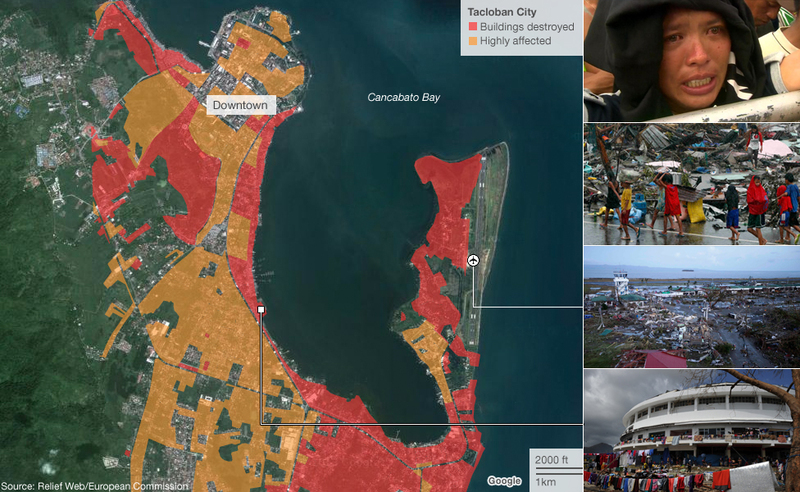 In Tacloban, a city of more than 220,000 people, the mayor has declared a state of calamity. Many peoples' homes have been destroyed and people are desperate for food and shelter, but debris and continuing bad weather are hampering efforts to distribute aid. The city lies on the easterly island of Leyte and caught the full force of the typhoon with winds approaching 310km/h (195mph). It was followed by a storm surge which is reported to have reached up to 5m and flattened homes, schools and badly damaged the airport. Like many places in the Philippines, much of Tacloban is very low-lying. The spit of land on which the airport is located lies well below five metres. Official figures from the Global Disaster Alert and Coordination System suggest the storm surge reached 2.3m in Tacloban, but anecdotal evidence from people on the ground suggests it was much higher. 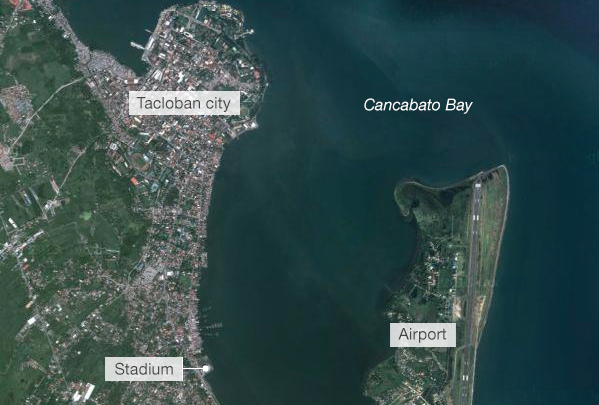 Tacloban is situated at the head of a bay, directly in line with the approaching typhoon. The winds pushed the water level higher and continued to rise as it was funnelled into the bay between the islands of Leyte and Samar, until it reached an estimated 5m around Tacloban and nearby settlements. Although the airport was severely damaged, it re-opened three days after the typhoon to allow in the first relief supplies. US military planes have begun delivering World Food Programme supplies, which are then being taken by helicopter to more remote regions. Many people have left Tacloban, but for those that remain the main concern is still food and water. Aid agencies have warned of a deteriorating security situation as people get more desperate. Although a field hospital has been set up, health officials have warned that the worst-affected areas were entering a peak danger period. With another tropical storm on its way to the Philippines, the need for shelter, safe water and sanitation is essential, if outbreaks of infectious diseases are to be avoided.